The term "Noise Level", as it appears here, has to do with reclaiming originality. Habit, arising over time out of ritual, dialogue, study, is a point of orientation for thought, and in particular in this case, creativity. The more habituated, the less open-minded and penetrating; the less original. From basic thematic associations to outright prejudices, the cultural linkages of habit interfere with creativity; they streamline it, stifle it, render it less radical and interesting. So, conducive to better creativity and ideas could be processes of association that have nothing to do with troublesome paradigms, in which the novel potential of juxtaposing unrelated concepts is explored. So much for Noise Level the concept, as it was pondered over by Raymond F. Jones in his eponymous 1952 short story. As for Noise Level the album, Strasbourg sound artist Gaëtan Gromer is here found attempting to apply theory in practice, unleashing creativity by embracing the sheer heterogeny of his work's various contents. As a starting point, all the sound material present originates from field recordings made inside libraries. This is a nod to the short story, but it also serves the wry function of making the institution of the library, typically associated with quietness, Gromer's first object of examination; his goal is perhaps to reduce the 'noise level' that makes the library quiet in the first place. For, of course, a library is really as rich with sound as anywhere else. Silence, wrote Salome Voegelin, is the start of listening. Gromer interprets the idea of silence in the library in this way, listening, capturing source material and eventually finding ways to manipulate it. He keeps things sparse, most of the time declining to mix more than a handful of channels together at a time. The first piece, 'The Shadow Out Of Time', couples harmonious drones with treated passages of hushed speech - the sotto voce of the library-goer - and ticking clockwork; perhaps a grandfather pendulum, judging from the woody grain. 'Mémoires du Futur' is centred around what sounds like a field recording contorted by an arpeggiator sequence; it has that slightly misshapen, mis-pitched texture to it exhibited by complex frequencies put through heavy processing. 'La Tour d'Aer', with subtle kicks and re-pitched, unidentified source material, is a little like some of the darker moments of Wolfgang Voigt's Gas works. What sounds like the low hum of a vending machine in 'La Bibliotheque De Babel' bellows in the foreground; louder than life and out of context, it gains a sinister presence among other creeping textures. This premise of this album hints that if its concept has been successfully applied, we are in for something of unusual originality. Exactly where this originality finds itself, whether it applies to this genre, compositional approach, to Gromer's individual creative development as an artist or to some other dimension of the work, isn't specified. But in terms of overall style, Noise Level doesn't substantially overpower the tropes of today's dark ambient/drone and electro-acoustic music. Nor do structures greatly vary throughout. What we generally encounter with all six tracks are several layers of drones, some light and some intense, which roll beneath various textural structures. Sometimes it's very compelling, sometimes a bit mundane. My view is that Gromer is comfortable in this style of music and not trying to develop it radically. Instead, I think his application of the noise level theory is twofold. First, by restricting available source material, he forces himself to re-examine the way in which he uses creative music technology, as well as the ways in which he is accustomed to hearing and thinking about the sounds captured on the recordings. Second, by telling us where these sounds came from, he has us listeners perform similar re-examinations. These are doctored combinations of sounds with which we're all quite familiar, but to which, in libraries if not in most other spaces, we are accustomed not to paying special attention. So hearing them with their contexts combined and rewritten unrealistically makes the material on these tracks disorientating and disjointed. And that's exactly our chance to think differently about habitually overlooked phenomena. Noise Level may have something to do with the creativity of technological sound manipulation, but most of all it deals with the creativity of listening itself. The title of this work is a Tibetan term which roughly means “being cut off” and is the practice of sacrificing the body. According to the liner notes, this practice include the completeness of existence which includes the bright part of being and the darker ones. 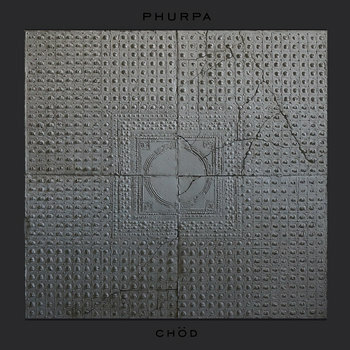 As in their previous releases, the musical form is based on voices and traditional instruments and is based in a relatively non occidental canon as their vision of drone is less related to sound and completely focused on an aid to meditation. The first part of this release starts with a vocal chant where the most bass frequencies of the voice are explored to obtain something between the religious rite and experimental music; where the voices stop sparse beat appear as a small interlude between sections. The second section of the track is based on traditional wind instruments, with a sound similar to a bagpipe, that create a dialectic between the two registers as if there's was a cold and a cold light. The voice return in the third section with a more tight dialogue with the drum and is resolved by the voice which returns to the point where the track started. The second part is opened by the wind instruments which develop the tension of the second section of the first part into a sort of juxtaposition of two lines, a fast one and a slow one, and their dynamics is able to evolve in a clear dialectic as one voice is highlighted with respect to the other in real alternation until the fast line close the section. The second section is focused on the chant which slowly evolves from bass pitches to higher ones with small silent section with sparse cymbal's shot between the tone's change, until the resonances of the recording room close this release. This release is a sonic monolith which could be rated as a masterpiece without any doubt, however their music is so extreme that the casual listener could be overwhelmed and eject the disc after few minutes. The patient ones, and fans on drones, will be taken into a deep reflection on existence and meditate a lot on it. Obviously unrated but it's one of the records of the year. “Aven”’s foundations are field recordings of underground glacial activity in Iceland. Like a visit to the glaciers themselves, it’s a humbling, epic experience- and also, assuming you don’t go to one of the tourist spots, a very solitary, plaintive, and even sinister experience too. “Aven” captures all of this absolutely beautifully. Walking directly along the borderline between found sound and composition, these geological sounds are supplemented by the subtlest of string instrument notes- gentle, pure single notes, ebbing and flowing at a speed that is sometimes barely more than glacial itself. It’s very nicely moderated, with subtly and space at its core. There’s rich, echo-ey production that allows sounds to decay gracefully. There are five tracks on the album, but the promo version of this album was provided as one continuous file, so it’s difficult to be sure where one track is intended to end and another begins, but it doesn’t matter; first and foremost it’s a complete, 28-minute work that makes me yearn for another Icelandic adventure. Tom Terrien’s recipes make jazz, but eschew the traditional double basses and trombones in favour of the building blocks of glitch, trap, dubstep, breakbeat, chin-stroking electronica and more. The result is hectic, achingly modern music that seems to be striving to be all things at once. There’s a tongue-in-cheek energy at work here, as heard in “Need For Spleen”, not merely from the title but from the content also. In some parts this is computer game music- frenetic, loopable, and dramatically quite variation-free. Some of the cheekiness strongly reminds me of Luke Vibert’s Wagon Christ sounds. Warp and Planet Mu are cited as influences on the PR sheet and they’re not hard influences to spot, there’s a definite cross-appeal audible in tracks like “Royal (4Pj)”. “Mai en Aout” is an absolutely beautiful solo piano work that sits almost at the end of the album, to catch you emotionally unawares, as though Terrien was determined to demonstrate that his musicality hasn’t been compromised by technology- and it works. Closer “Pygz” winds everything down and knits everything together in a blend of smooth and cut-up that’s akin to Craig Armstrong with a heavy migraine. Dedicated followers will be sure to pick up the limited edition teal-coloured cassette (oh yes it is), but for anyone else, I’d definitely recommend tracking down the pay-what-you-want digital download. And don’t just click ‘0’, this release should be highly valued.